There’s just something about the chill of winter and fall to make us constantly crave warm and satisfying comfort food. And to me, there’s nothing more comforting than a good old-fashioned, big bowl of soul-satisfying beef stew. It’s rich, it’s hearty, it’s delicious, and it really fills you up. In the past, I’ve always made slow cooker beef stew recipes, and don’t get me wrong – they are all fantastic. But the thing is, they take at least 8 hours to cook, which means I have to make sure I get everything prepared and in the crock pot earlier in the day. Not a problem, if I have the time. But with my busy schedule these days, it’s not often that I have a lazy Sunday morning to work on my crock pot beef stew. I usually have just an hour or two before mealtime to get my cooking done, and this is where my Instant Pot comes to the rescue. I know, I know…you’ve heard all about the Instant Pot a gazillion times, and I have posted a lot of Weight Watchers Instant Pot recipes lately. But I can’t help it! With two kids involved in tons of sports or activities, my days are busy, busy, busy, and I use my Instant Pot a lot. A LOT. And I’m afraid I can’t be stopped. Plus, I’m excited, and just want to share tasty recipes that will help out other busy moms or families, so that they can get a healthy and delicious meal on the table in a lot less time. Can you blame me for that? However, I know that not everyone has an Instant Pot, and some of you may not have even taken yours out of the box yet! Or maybe you’re waiting for Black Friday to buy one. Either way, I’ve got your back. I’ll make sure to include the instructions for cooking this in the slow cooker too so that you can still partake in the deliciousness of what may be the best beef stew recipe you’ll ever make. Not only does the pressure cooking make the vegetables and beef so fall apart-tender in such a short amount of time, it really helps to develop all those deep, rich flavors of the stew. And if you happen to have any leftovers, those flavors get even better overnight! This Instant Pot Beef Stew Recipe has become a family favorite. No one can seem to get enough of it – especially my kids, which makes this mama’s heart SO happy. I love serving it with a warm, crusty baguette and fresh salad. Yum! I still pull out my trusty slow cooker every now and then, but this, as with many of my other Instant Pot recipes has me saying that I’ll never cook beef stew any other way again. It’s just too fast and too easy to cook it this way. Truly, this perfect Instant Pot Beef Stew Recipe will have you saying the same, soon enough. PRO TIP: Browning the meat first really helps to caramelize the meat and brings on an extra layer of flavor that’s worth that bit of extra time it takes to do it. But if you are really short on time, you can skip that step, and just dump everything in the pot and go. 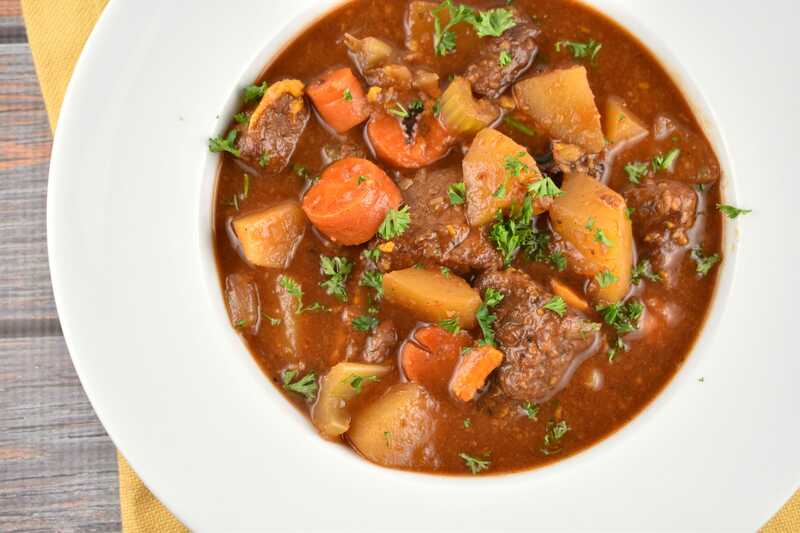 CHECK OUT MY OTHER BEEF STEW RECIPES! Hearty and satisfying beef stew cooked in less than an hour with the Instant Pot. It’s full of tender vegetables and juicy, succulent beef that will melt in your mouth. In a large Ziploc bag, combine the flour, oregano, onion powder, garlic powder, parsley, salt and pepper. Add in the beef chunks, and shake well to evenly coat meat. Set Instant Pot to saute. When hot, add in oil and meat to pot. Working in small batches, brown the meat on all sides. Make sure not to overcrowd the pan! Transfer browned meat to a dish and set aside. Add in the onions and garlic to the Instant Pot, and saute for a about 2 minutes. Then stir in balsamic vinegar, tomato paste, and ½ cup of the beef broth, and using a wooden spoon, deglaze the pan, making sure to scrape up all the browned bits. Return the beef to the Instant Pot, and then add vegetables, and all remaining ingredients. Stir to combine, and in some water, if necessary to cover everything. Place lid on Instant Pot and turn saute setting off. Set to high pressure on manual mode for 25 minutes. Let release naturally for 15 minutes. *Optional Step: If you prefer your stew to be thicker, just whisk together 2 tablespoons of water with 2 tablespoons cornstarch. Switch the Instant Pot to saute, and let the stew to come to a simmer and the liquid should thicken up. Complete steps one and 2 as is, but brown meat in a skillet instead of the Instant Pot. Add browned beef and remaining ingredients to slow cooker. Cover and cook on high for 8 hours or low for 10 hours. In the ingredients list it says 1/4… 1/4 what? :) Also, see tomato paste in the description but not ingredients list – is it the whole can? Thanks! It’s a chilly, rainy day here in British Columbia, Canada, and your stew hit all the right notes: hearty, hot, savoury, and satisfying. It’s the ultimate comfort food for gray weather! I found a couple of inconsistencies in your recipe/method, and wanted to ask you about them. As mentioned above, tomato paste was included in the assembly method, but not in the ingredients list. Worcestershire sauce was in the ingredients list but not the assembly. Regardless, it’s a yummy stew and I can’t wait to dish it up for dinner! Thanks for the recipe, and for calculating the sp value. I just entered this recipe into my Weight Watchers tracker and it came up with 10 points a serving. The lean chuck roast is 36 pts, the sweet potato is 8 points, the russet potato is 17 points, tomato paste – 2 pts, olive oil – 4 pts, onion soup mix – 2 pts, balsamic – 1 pt, beef broth – 2 pts, and the whole wheat flour – 3 pts. The rest of the ingredients are 0 pts. I put this all under 8 servings. Did I do something wrong? Otherwise, the recipe was excellent! The meat was so tender! My whole family of picky eaters loved it! Hi Jen! I think the error may have been in the selection of meat in the Recipe Builder. I selected the “32oz Beef, chuck, boneless, lean and trimmed, raw”, which was 26 Points. If you select the cooked meat in the recipe builder, the Points will be higher. Here’s a link to the image of my recipe builder screenshot: https://imgur.com/a/3B2nJ. One other thing though…I DID manage to forget to calculate the sweet potato in my original calculation, so the correct Points should be 6, not 5. I’ve updated the post. Thanks for helping me catch that! In your ingredient list, under Worcestershire Sauce and above the Bay Leaves it says “1/4 cup”, but it doesn’t list the ingredient. Is that perhaps the tomato paste? !Made this last night after prepping the day before. It was wonderful! I didn’t use tomato paste as I didn’t see it in the ingredients. Thanks so much for a great recipe!